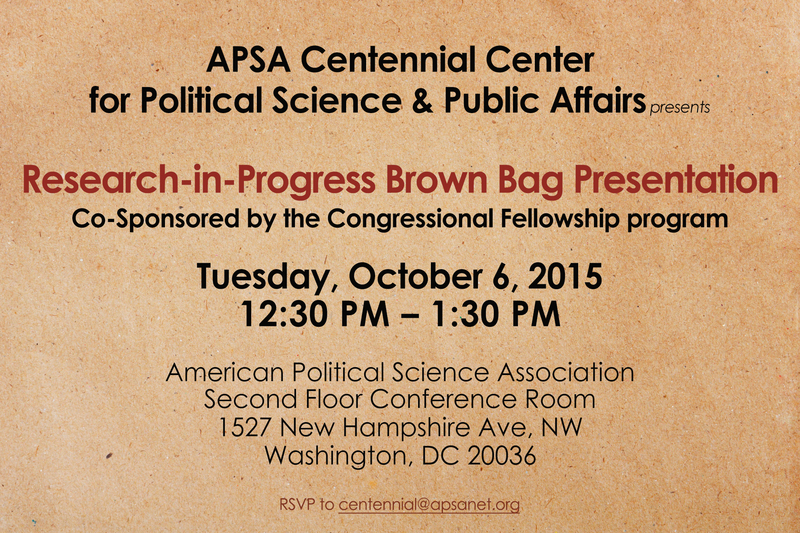 APSA established the Centennial Center for Political Science and Public Affairs to encourage individual research and writing in all fields of political science, to facilitate collaboration among scholars working within the discipline and across the social and behavioral sciences and humanities, and to promote communication between scholars and policymakers. In addition to providing research grants, the Centennial Center periodically sponsors events that bring together the scholarly community, policy makers, the media, and general public for discussions of broad interest. Visiting scholars in residence at the Centennial Center are expected to pursue their own research and teaching projects and contribute to the intellectual life of the residential community by sharing their work, including brown bag seminars. This research proposes that the role of norms can explain aspects of congressional behavior that contemporary, dominant partisan theories of Congress alone cannot. The research builds upon aspects of my dissertation, which applied partisan theory to examine the utilization of conference committees. However, this project seeks both to expand the explanatory variables beyond those of partisan theory to include congressional norms as well as to lay the groundwork for a social theory of Congress in which ideational and constitutive factors condition congressional behavior. This research is part of Alexander’s ongoing work on changing legislative norms in a polarized congress. The output of work conducted at the Centennial Center under the Steiger Fellowship will be a literature review, a robust research design, an interview protocol, and a project plan for continued progress. Gerzhoy investigates the conditions under which states with nuclear weapons ambitions comply with or defy international demands for nuclear restraint. He challenges two important arguments in the academic and policy debates over nonproliferation. First, by identifying coercive leverage as a principal cause of nuclear restraint, my theory contests the idea that nuclear decisions are rooted primarily in unit-level variables such as regime type, economic openness, or elite psychology, and it contributes to a growing literature that highlights the critical role of U.S. policy in containing the spread of nuclear weapons. At the same time, Gerzhoy’s opposes the idea that with the application of sufficient coercive leverage, any state can be compelled to abandon its bomb aims. Rather, it argues that both leverage and security are required to produce nuclear restraint—in the absence of one or the other, proliferation will continue. Throwback Thursdays: #APSA2009 Race, Ethnicity, and Politics – Toronto, Ont.